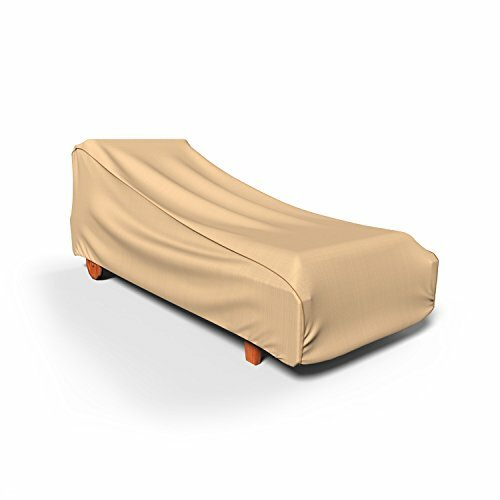 The Chelsea Patio Chaise Lounge Cover provides high quality protection to your outdoor chaise lounge chair. With a sophisticated design that is both stylish and functional, the Chelsea Collection by Budge provides excellent weather protection, so you’ll never have to worry again about hiding your furniture under an ugly tarp or storing it away in the garage. This collection is a neutral tan in color and will look great against any backyard or outdoor living space. The Chelsea Collection is made from a durable, 600 denier polyester (the same material that Budge uses to effectively protect boats from hazardous outdoor weather conditions). This outdoor chaise lounge cover material will defend your patio furniture against heavy rains, sun exposure, dirt and dust, falling tree sap and leaves, pollen and much more. Four sewn-in straps are included to help better secure the cover to your furniture in windy conditions. The seams are ultra-sonically welded together to enhance both the protective properties and longevity of the covers. Vents are strategically placed throughout the covers to ensure adequate air flow to release any trapped condensation that may cause mold from growing under the cover. This patio chaise cover measures 30" H x 27" W x 80" D.